KNAC.COM - News - Eddie Trunk Rocks! The Big Apple. Metropolis. Gotham. When you live in a city of 15 million people, nicknames come as easy as a schoolboy on a day trip to the Chicken Ranch. There are only three states that have populations bigger than that of New York City. You could put the entire population from the state of Arkansas inside New York City…5 Times! That’s a lot of interns. Even in a city as massive as this, where's the metal? Like so many other big cities, Los Angeles included, hard rock and heavy metal radio is missing, if it were a child a nationwide Amber Alert would be declared. 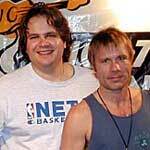 The only sign of life for hard music exists for a few hours each weekend on WNEW in NYC. Enter Eddie Trunk. Since 1984 Eddie has been flying the Metal banner on NY & New Jersey radio stations often without the help of management and record label support. That’s changed as the beast from the East has risen. Once a VP at Megaforce Records, Eddie is now armed to the teeth and as of last week launched his show, Eddie Trunk Rocks, to a nationwide syndicated radio audience. I’m pleased to announce that as of Thursday, Eddie will now have a worldwide audience, as KNAC.COM becomes the show’s exclusive net-only affiliate. Eddie Trunk Rocks will air on KNAC.COM on Thursday mornings from 6-10am PDT and starting on October 5th, a replay can be heard at the same time every Saturday. Welcome aboard Eddie!